The BaseORMService is a core model CFC of the module that will provide you with a tremendous gammut of API methods to interact with ColdFusion ORM Entities. The idea behind this support class is to provide a very good base or parent service layer that can interact with ColdFusion ORM via hibernate and entities inspired by Spring's Hibernate Template support. 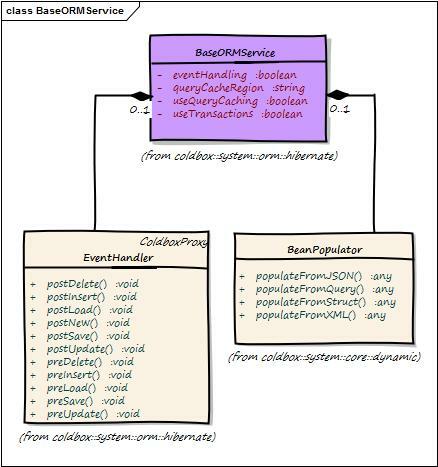 This means that you don't need to create a service layer CFC in order to work with ORM entities. It provides tons of methods for query executions, paging, transactions, session metadata, caching and much more. You can either use the class on its own or create more concrete service layers by inheriting from this class. In order to get started with the base ORM service you need to know how to get access to it. You can do this via WireBox injection DSL or by the model's ID. The module also registers a new WireBox DSL called entityservice which can produce virtual or base orm entity services that you can use to inject into your own event handlers or models. Once you have access to the injected base ORM service, you can use it in all of its glory. Important Please check out the latest API Docs for the latest methods and functionality. Once you have a reference to the base ORM service then you can use any of its methods to interact with ORM entities. The drawback about leveraging the base ORM model is that you cannot add custom functions to it or tell it to work on a specific entity for all operations. It is a very simple API, but if you need more control then we can start using other approaches shown below. We also have a virtual service layer that can be mapped to specific entities and create entity driven service layers virtually. Meaning you don't have to be passing any entity names to the API methods to save you precious typing time.